"Themata" redirects here. For the album, see Themata (album). 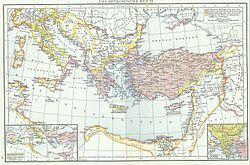 The themes or themata (Greek: θέματα, thémata, singular: θέμα, théma) were the main military/administrative divisions of the middle Byzantine Empire. They were established in the mid-7th century in the aftermath of the Slavic invasion of the Balkans and Muslim conquests of parts of Byzantine territory, and replaced the earlier provincial system established by Diocletian and Constantine the Great. In their origin, the first themes were created from the areas of encampment of the field armies of the East Roman army, and their names corresponded to the military units that had existed in those areas. The theme system reached its apogee in the 9th and 10th centuries, as older themes were split up and the conquest of territory resulted in the creation of new ones. The original theme system underwent significant changes in the 11th and 12th centuries, but the term remained in use as a provincial and financial circumscription until the very end of the Empire. During the late 6th and early 7th centuries, the Byzantine Empire was under frequent attack from all sides. The Sassanid Empire was pressing from the east on Syria, Egypt, and Anatolia. Slavs and Avars raided Thrace, Macedonia, Illyricum and Greece and settled in the Balkans. The Lombards occupied northern Italy, largely unopposed. In order to face the mounting pressure, in the more distant provinces of the West, recently regained by Justinian I (r. 527–565), Emperor Maurice (r. 582–602) combined supreme civil and military authority in the person of an exarch, forming the exarchates of Ravenna and Africa. These developments overturned the strict division of civil and military offices, which had been one of the cornerstones of the reforms of Diocletian (r. 284–305). In essence however they merely recognized and formalized the greater prominence of the local general, or magister militum, over the respective civilian praetorian prefect as a result of the provinces' precarious security situation. This trend had already featured in some of the administrative reforms of Justinian I in the 530s. Justinian had given military authority to the governors of individual provinces plagued by brigandage in Asia Minor, but more importantly, he had also created the exceptional combined military-civilian circumscription of the quaestura exercitus and abolished the civilian Diocese of Egypt, putting a dux with combined authority at the head of each of its old provinces. However, in most of the Empire, the old system continued to function until the 640s, when the eastern part of the Empire collapsed under the onslaught of the Muslim Caliphate. The rapid Muslim conquest of Syria and Egypt and consequent Byzantine losses in manpower and territory meant that the Empire found itself struggling for survival. In order to respond to this unprecedented crisis, the Empire was drastically reorganized. The remaining imperial territory in Asia Minor was divided into four large themes, and although some elements of the earlier civil administration survived, they were subordinated to the governing general or stratēgos. The origin and early nature of the themes has been heavily disputed amongst scholars. The very name thema is of uncertain etymology, but most scholars follow Constantine Porphyrogennetos, who records that it originates from Greek thesis ("placement"). The date of their creation is also uncertain. For most of the 20th century, the establishment of the themes was attributed to the Emperor Heraclius (r. 610–641), during the last of the Byzantine–Sassanid Wars. Most notable amongst the supporters of this thesis was George Ostrogorsky who based this opinion on an extract from the chronicle of Theophanes the Confessor mentioning the arrival of Heraclius "in the lands of the themes" for the year 622. According to Ostrogorsky, this "shows that the process of establishing troops (themes) in specific areas of Asia Minor has already begun at this time." This view has been objected to by other historians however, and more recent scholarship dates their creation later, to the period from the 640s to the 660s, under Constans II (r. 641–668). It has further been shown that, contrary to Ostrogorsky's conception of the themata being established from the outset as distinct, well-defined regions where a stratēgos held joint military and civil authority, the term thema originally seems to have referred exclusively to the armies themselves, and only in the later 7th or early 8th centuries did it come to be transferred to the districts where these armies were encamped as well. Tied to the question of chronology is also the issue of a corresponding social and military transformation. The traditional view, championed by Ostrogorsky, holds that the establishment of the themes also meant the creation of a new type of army. In his view, instead of the old force, heavily reliant on foreign mercenaries, the new Byzantine army was based on native farmer-soldiers living on state-leased military estates. (compare the organization of the Sasanian aswaran) More recent scholars however have posited that the formation of the themes did not constitute a radical break with the past, but rather a logical extension of pre-existing, 6th-century trends, and that its direct social impact was minimal. Byzantine themata in Anatolia, c. 750. The Byzantine themata in Asia Minor as they existed in c. 780, following the creation of the Bucellarian and Optimatoi themes out of the original theme of the Opsikion. What is clear is that at some point in the mid-7th century, probably in the late 630s and 640s, the Empire's field armies were withdrawn to Anatolia, the last major contiguous territory remaining to the Empire, and assigned to the districts that became known as the themes. Territorially, each of the new themes encompassed several of the older provinces, and with a few exceptions, seems to have followed the old provincial boundaries. The first four themes were those of the Armeniacs, Anatolics and Thracesians, and the Opsician theme. The Armeniac Theme (Θέμα Άρμενιάκων, Thema Armeniakōn), first mentioned in 667, was the successor of the Army of Armenia. It occupied the old areas of the Pontus, Armenia Minor and northern Cappadocia, with its capital at Amasea. The Anatolic Theme (Θέμα Άνατολικῶν, Thema Anatolikōn), first mentioned in 669, was the successor of the Army of the East (Άνατολῆ, Anatolē). It covered southern central Asia Minor, and its capital was Amorium. Together, these two themes formed the first tier of defence of Byzantine Anatolia, bordering Muslim Armenia and Syria respectively. The Thracesian Theme (Θέμα Θρᾳκησίων, Thema Thrakēsiōn), first mentioned clearly as late as c. 740, was the successor of the Army of Thrace, and covered the central western coast of Asia Minor (Ionia, Lydia and Caria), with its capital most likely at Chonae. The Opsician Theme (Θέμα Ὀψικίου, Thema Opsikiou), first mentioned in 680, was constituted from the imperial retinue (in Latin Obsequium). It covered northwestern Asia Minor (Bithynia, Paphlagonia and parts of Galatia), and was based at Nicaea. Uniquely, its commander retained his title of komēs ("count"). In addition, the great naval division of the Carabisians or Karabisianoi (Kαραβισιάνοι, "people of the κάραβοι [ships]"), first mentioned in 680, was probably formed of the remains of the Army of the Illyricum or, more likely, the old quaestura exercitus. It never formed a theme proper, but occupied parts of the southern coast of Asia Minor and the Aegean Islands, with its stratēgos seat most likely at Samos. It provided the bulk of the Byzantine navy facing the new Arab fleets, which after the Battle of the Masts contested control of the Mediterranean with the Empire. In the event, the Carabisians would prove unsatisfactory in that role, and by 720 they had been disbanded in favour of a fully-fledged naval theme, that of the Cibyrrhaeots (Θέμα Κιβυρραιωτῶν, Thema Kibyrrhaiotōn), which encompassed the southern coasts of Asia Minor and the Aegean islands. The part of the region of Thrace under Byzantine control was probably constituted as a theme at about 680, as a response to the Bulgar threat, although for a time the command over Thrace appears to have been exercised by the Count of the Opsikion. Successive campaigns by the emperors of the Heraclian dynasty in Greece also led to the recovery of control of Central Greece from Slavic invaders, and to the establishment of the theme of Hellas there between 687 and 695. Sicily too was formed as a theme by the end of the 7th century, but the imperial possessions in mainland Italy remained under the exarch of Ravenna or the local doukes, as did Byzantine Africa until the fall of Carthage in 698. At the same time, Crete and the imperial exclave of Cherson in the Crimea formed independent archontiai. Thus, by the turning of the century, the themes had become the dominant feature of imperial administration. Their large size and power however made their generals prone to revolt, as had been evidenced in the turbulent period 695–715, and would again during the great revolt of Artabasdos in 741–742. The suppression of Artabasdos' revolt heralded the first significant changes in the Anatolian themes: the over-mighty Opsikion was broken up with the creation of two new themes, the Bucellarian Theme and the Optimates, while the role of imperial guard was assumed by a new type of professional force, the imperial tagmata. Byzantine themata in Anatolia, c. 950. Despite the prominence of the themes, it was some time before they became the basic unit of the imperial administrative system. Although they had become associated with specific regions by the early 8th century, it took until the end of the 8th century for the civil fiscal administration to begin being organized around them, instead of following the old provincial system. This process, resulting in unified control over both military and civil affairs of each theme by its strategos, was complete by the mid-9th century, and is the "classical" thematic model mentioned in such works as the Klētorologion and the De Administrando Imperio. At the same time, the need to protect the Anatolian heartland of Byzantium from the Arab raids led to the creation, in the later 8th and early 9th centuries, of a series of small frontier districts, the kleisourai or kleisourarchiai ("defiles, enclosures"). The term was previously used to signify strategically important, fortified mountain passages, and was now expanded to entire districts which formed separate commands under a kleisourarchēs, tasked with guerrilla warfare and locally countering small to mid-scale incursions and raids. Gradually, most of these were elevated to full themes. With the beginning of the Byzantine offensives in the East and the Balkans in the 10th century, especially under the warrior-emperors Nikephoros II (r. 963–969), John I Tzimiskes (r. 969–976) and Basil II (r. 976–1025), newly gained territories were also incorporated into themes, although these were generally smaller than the original themes established in the 7th and 8th centuries. The themata of the Byzantine Empire, at the death of Basil II in 1025. At this time, a new class of themes, the so-called "minor" (μικρὰ θέματα) or "Armenian" themes (ἀρμενικὰ θέματα) appear, which Byzantine sources clearly differentiate from the traditional "great" or "Roman" themes (ῥωμαϊκά θέματα). Most consisted merely of a fortress and its surrounding territory, with a junior stratēgos (called zirwar by the Arabs and zoravar by the Armenians) as a commander and about 1,000 men, chiefly infantry, as their garrison. As their name reveals, they were mostly populated by Armenians, either indigenous or settled there by the Byzantine authorities. One of their peculiarities was the extremely large number of officers (the theme of Charpezikion alone counted 22 senior and 47 junior tourmarchai). While well suited for defence, the "Armenian" themes were incapable of responding to major invasions or undertake sustained offensive campaigns on their own. Thus, from the 960s, more and more professional regiments, both from the old tagmata and newly raised formations, were stationed along the border. To command them as well as coordinate the forces of the small frontier themes, a number of large regional commands ("ducates" or "catepanates"), under a doux or katepano, were set up. In the East, the three original such commands, set up by John Tzimiskes, were those of the doukes of Antioch, Chaldia and Mesopotamia. As Byzantium expanded into Greater Armenia in the early 11th century, these were complemented or replaced by the commands of Iberia, Vaspurakan, Edessa and Ani. In the same vein, the "Armenian" themes seem to have been placed under a single strategos in the mid-11th century. The series of soldier-emperors culminating in Basil II led to a situation where by 1025 Byzantium was more powerful than any of its enemies. At the same time, the mobile, professional forces of the tagmata gained in importance over the old thematic armies (and fleets) of the interior, which soon began to be neglected. Indeed, from the early 11th century military service was increasingly commuted to cash payments. While the frontier ducates were able to meet most local threats, the dissolution of the old theme-based defensive system deprived the Byzantine defensive system of any strategic depth. Coupled with increasing reliance on foreign mercenaries and the forces of allied and vassal states, as well as the revolts and civil wars resulting from the widening rift between the civilian bureaucracy in Constantinople and the land-holding military elites (the dynatoi), by the time of the Battle of Manzikert in 1071, the Byzantine army was already undergoing a severe crisis and collapsed completely in the battle's aftermath. Map of Theme Sirmium within Byzantine Empire in 1045. The term thema was ambiguous, referring both to a form of military tenure and to an administrative division. A theme was an arrangement of plots of land given for farming to the soldiers. The soldiers were still technically a military unit, under the command of a strategos, and they did not own the land they worked as it was still controlled by the state. Therefore, for its use the soldiers' pay was reduced. By accepting this proposition, the participants agreed that their descendants would also serve in the military and work in a theme, thus simultaneously reducing the need for unpopular conscription as well as cheaply maintaining the military. It also allowed for the settling of conquered lands, as there was always a substantial addition made to public lands during a conquest. The commander of a theme, however, did not only command his soldiers. He united the civil and military jurisdictions in the territorial area in question. Thus the division set up by Diocletian between civil governors (praesides etc.) and military commanders (duces etc.) was abolished, and the Empire returned to a system much more similar to that of the Republic or the Principate, where provincial governors had also commanded the armies in their area. This list includes the large "traditional" themes established in the period from the inception of the theme system in c. 660 to the beginning of the great conquests in c. 930 and the creation of the new, smaller themes. These were the new major or minor themes (provinces), established during the Byzantine conquests, in the East (the so-called "Armenian" themes or generalships, strategiai), in Italy and in the Balkans. (Ἄρτζε) 970s Artze A minor theme attested in the Escorial Taktikon. Ceded to David III of Tao in 979, recovered after David's death in 1000 and subordinated to the catepanate of Iberia. The town was destroyed by the Turks in 1049. (Ἀσμόσατον) c. 938 Asmosaton A minor theme, it survived until conquered by the Turks in the 1050s. (thema Boulgarias, Θέμα Βουλγαρίας) 1018 Scupi established by Emperor Basil II after the victory over Samuel of Bulgaria and the fall of the First Bulgarian Empire in 1018. It was based on the wider regions of Skopje and Ohrid (modern Republic of Macedonia and south Serbia). (Χαρπεζίκιον) 949 Charpezikion A minor theme. (Χαυζίζιον) after 940 Chavzizin A minor theme covering the area of the Bingöl Dağ mountains. (Χόζανον) before 956, possibly 948/952 Chozanon An "Armenian theme". (thema Kyprou, Θέμα Κύπρου) 965 Leukosia Byzantine-Arab condominium from 688 until the definite Byzantine reconquest in 965. (Δερζηνῆ) 948/952 Chozanon A minor theme, the administration of Derzene was often entrusted to officials of the theme of Chaldia. (thema Edēssēs, Θέμα Εδέσσης) 1032 Edessa Captured by George Maniakes in 1032, it became seat of a strategos, later a doux, until conquered by the Turks on 1086. (Παρευφρατίδαι Πόλεις) c. 1032 Minor theme. (Ἑξακωμία/Ἑξάπολις) 970s Minor theme, its name means "six villages/cities", a region between Lykandos and Melitene. It apparently was also an episcopal see. (θέμα 'Ιβηρίας) c. 1001 or c. 1023 Theodosiopolis Formed out of the territories of David III of Tao–Tayk, which he bequeathed to Basil II. The date of establishment is disputed among scholars. United with Ani in 1045 and with Kars in 1064. (Κάμα) 970s Minor theme attested only in the Escorial Tactikon, location uncertain. (Ματζικέρτ) 1000 Manzikert Part of the territories inherited from David III of Tao, it was the seat of a strategos, later probably a subordinate of the doux of Vaspurakan. (Μελιτηνή) 970s Melitene Became an imperial curatorship (kouratoreia) after conquered by John Kourkouas in 934. (Σαμόσατα) 958 Samosata Became the seat of a strategos after the Byzantine conquest in 958. (Τάραντας) 970s Tarantas Minor theme attested only in the Escorial Taktikon. (Ταρών) 966/7 A dependency of the Empire since the early 10th century, the region of Taron became a theme in 966/7 and remained a Byzantine province until lost to the Turks after Manzikert. (thema Tephrikēs/Leontokōmēs, Θέμα Τεφρικής/Λεωντοκώμης) 934/944 Tephrike Formed as a kleisoura after the Byzantine conquest of the Paulician principality of Tephrike, renamed Leontokome under Leo VI the Wise, became a theme in the 930s. (Θεοδοσιούπολις) 949, again in 1000 Theodosiopolis Formed as a theme after the Byzantine conquest in 949, ceded to David III of Tao in 979, recovered in 1000, it became the capital of the theme of Iberia. (Βαασπρακανία) 1021/2 Established when Seneqerim-Hovhannes, king of Vaspurakan, ceded his realm to the Empire. Governed by a doux/katepano at Van, it lasted until overrun by the Turks after 1071. Maeander after 1204 a minor theme of the Nicaean period, which eventually became part of the southern Thracesian theme. Mylasa and Melanoudion 1143 a minor theme comprising the territories in Asia Minor south of the Maeander valley, created from parts of the Cibyrrhaeot and Thracesian themes. Its existence continued under the Nicaean Empire. Neokastra between 1162 and 1173 created from the northern Thracesian theme as part of Manuel Komnenos' reorganization of the Asiatic frontier. Its existence continued under the Nicaean Empire. Angold, Michael (1975). A Byzantine Government in Exile: Government and Society Under the Laskarids of Nicaea (1204–1261). Oxford, United Kingdom: Oxford University Press. ISBN 0-19-821854-0. Krsmanović, Bojana (2008). The Byzantine Province in Change: On the Threshold Between the 10th and the 11th Century. Belgrade: Institute for Byzantine Studies. Pertusi, A. (1952). Constantino Porphyrogenito: De Thematibus (in Italian). Rome: Biblioteca Apostolica Vaticana.